Here's another animal card made with the same set of stamps from Creative Stamping magazine that I used for this elephant card. The main stamped image is of a koala, with a separate stamp of a branch that I coloured brown with Promarkers, and finally a third stamp of the leaves which I used with green ink. 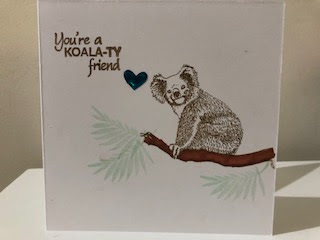 The sentiment, 'you're a koala-ty friend' is a cute pun and one that makes the card suitable for pretty much any occasion - a birthday or thank you or just a note. As a final touch I added a glitter heart sticker next to the sentiment. What a cute scene and the koala is super sweet! Thank you for joining Simon Says Stamp Monday Challenge.